This seminar presents treatment and management principles for improving functional gait in adults. 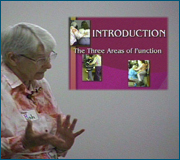 Topics include: Developmental Concepts, Areas of Function, Basic Components of Movement, Principles of Treatment, Handling Skills Leading to Better Function, Components of Gait, The Gait Sequence, Facilitation of the Trunk, Increasing Weight Bearing on the Involved Arm and Leg, Facilitation of Standing, Stepping and Walking. Handouts included in PDF file format. 1. 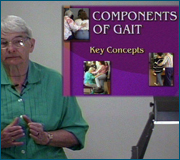 Identify the developmental concepts related to functional gait. 2. Identify the basic components of movement. 3. Identify management & treatment principles. 4. Identify the characteristics of physical handling. 5. Identify the components of gait. 6. Identify the basic characteristics of the "Pusher" Syndrome. 8. Describe the basic facilitation techniques for improving gait. Level II Introductory/Level I required (Sem2A or equivalent).